We work with small church, large churches and churches that seem to change sizes every other month. We work with some that over-utilize technology and some that don’t even know how to spell “technology.” We work with some who are just starting and are exploding in numbers, and some that are on the verge of closing down. We work with pastors, lay leaders, elder board members, and many other people that are responsible for various aspects of the church’s ministry. Every church is unique…as are the individuals that makeup each church. As with any industry, some are more effective than others. Some are excellent at defining their vision and have few but highly detailed targets, while others are excellent at perpetuating the idea that people like us shouldn’t make statements about whether one church is more effective than another. It’s just par for the course. None of it really bothers us and, quite frankly, differences within the church is part of what makes us all unique and helps us strive to reach more people for Christ. Churches that do not answer the phone. I cannot tell you how often this happens, but it is a lot. I don’t want to leave a message. I don’t want to push number 3 if I want a directory. I’m not calling a billion dollar corporation that has spent millions of dollars to outsource their customer service help lines. I’m calling a church, so please answer the phone. Why is this important? PEOPLE. You are in the business of people. Nothing…nothing is more important in your industry. In our 21st century, digital, totally connected, we-have-an-awesome-website-so-go-there-for-information, and send a tweet world, people still need to connect on a deeper level. People still need to hear a voice. People still have questions that are not answered on your Facebook page or Instagram account. I just need to talk to Bob or Francine, but now I have to leave a message because “nobody is available to answer your call at the moment.” That makes me feel like I wonder if/when/will Bob ever actually get my message. Now in most cases, we’re doing business with these churches. We’re consulting for vision and direction, or ministry strategy, or staff consulting. If I feel frustrated that I cannot get a hold of the right people (or any people), how must new people who are genuinely interested in attending your church feel? You are in the business of people. You are in the business of building relationships. When someone calls, it’s nice to hear a live person. It brings a sense of life and caring that otherwise would not be there. 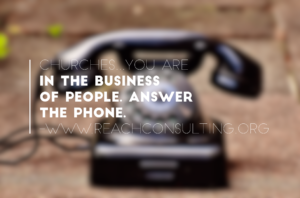 How many people do you think might call your church and ask for some level of information? It might be information about attending. Maybe a member who wants to volunteer. Maybe a member who needs some counseling. The reality is, you have no idea. And that means you have no idea how much of an impact you might be able to make in more people’s lives since many people won’t leave a message or get lost in the automated system. Now, I recognize technology has a place. The church website is still the most valuable communication tool the church has and a vast majority of people will go their first. But when they do call…and they still do…people need to know they’re going to get a real person, not some message machine. I understand we cannot expect a live person 24 hours a day and we cannot expect every employee to be present and answer the phone every time a person calls. I get that. Messages still need to be left. Voice mail is still a valuable tool. But during generally accepted business hours, somebody needs to answer the phone. This can be done in various ways. For large churches who have a large staff, simply apply this to somebody’s daily responsibilities and make sure they follow through. Or find a group of volunteers to rotate…each serving half a day once per week. Small churches can utilize volunteers in this manor also. Other options include the use of technology. If you have volunteers that are willing to help, but cannot be present at your facilities, then set up a plan with your phone system or phone service provider and have the number forwarded to your volunteer. Or have it forwarded to a cheap cell phone that is passed around. Remember, you are in the business of people.